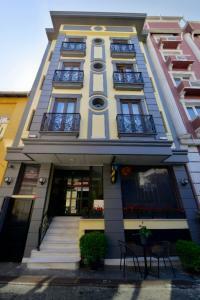 May Hotel is located in one of the oldest and most colourful quarters of Istanbul in the old historical peninsula. Whether you are in Istanbul for business or leisure, May hotels rooms will cover all your needs with its contemporary well planned setting and comfort. All rooms offers orthopedic beds, air conditioner, direct dial telephone, LCD TV, free wireless internet, minibar. Delicious open buffet breakfast is offered complimentary. Discover Istanbul from the best point old peninsula which is covered with centuries old buildings, mosques, churches, synagogues; gong and azan mixed to each other is a culture, shopping and entertainment center of Istanbul. May Hotel is situated just at the heart of peninsula. Kumkapı fish restaurants area is just next door will offer wide varieties of tastes which you will never forget.Historical peninsula may be reached in about 5 minutes. Sultanahmet district which hosts Roman, Byzantine and Ottoman cultures is awaiting you to reveal its hidden beauties. Famous world heritages such as Topkapi Palace, Hagia Sophia, Basilica Cistern, Blue Mosque, Grand Bazaar and many more are here. From the point you enter into the lobby of May Hotel, you will begin to feel the sincere service attitude with a professional manner. Be sure your stay will be perfect. Perched above the ruins of the Byzantine era Magnaura Palace lays the modern day Magnaura Palace Hotel. Each room was expertly designed with the comfort and opulence of its guests in mind. Adorned in sleek contemporary Turkish décor, regal mahogany furniture, and rejuvenating toiletries along with a breathtaking view of the Marmara Sea to cater to your senses for the ultimate escape in the middle of bustling Sultanahmet district. 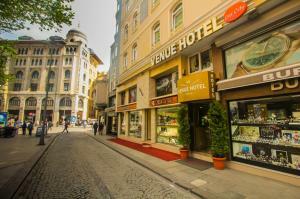 Let the outstanding staff of Magnaura Palace Hotel cater to you while you explore the treasure that is Istanbul. Urban Homes lies in the heart of Beyoğlu offering a unique experience along with urban temptations of the Cihangir district, famous for its gourmet tastes and entertaining night life. Located in 5 minutes walk distance to İstiklal Street, previously known as Pera, reflecting the essence of Istanbul with its avenues, streets, cultural activities and clubs. When the word Istanbul is mentioned, Beyoğlu instantly comes to mind. Urban Homes İstanbul is a self-catering accommodation. Free Wi-Fi access is available throughout. It is easy to access historical and central locations of the city using public transportation vehicles. Modernly and elegantly decorated units of Urban Homes İstanbul come with a flat-screen tv, air conditioning and a minibar. Featuring luxuries bathrooms also come with a hairdryer and a bathrobe. Some of the properties have a balcony and a terrace. There is a full kitchen with a dishwasher, fridge and stove, which provides you to cook your own meals and enjoy it on site. There are also many restaurants in the surrounding area. Currency exchange and car rentals are offered by the property. Laundry, dry cleaning and ironing services can also be provided upon request at an additional charge. Airport shuttle services to Istanbul Ataturk Airport, located 24 km away, are organized at an extra fee. The best hostel in Istanbul: Chambers of the Boheme. Located in the heart of Istanbul Chambers of the Boheme is truly the most beautiful hostel in Istanbul with an unbeatable central location, extreme comfort and sincere customer service. Just steps away from Taksim Square, Chambers of the Boheme puts the best of Istanbul's unparalleled nightlife at your fingertips. Whether you fancy a night of Turkish delights and nargile, a cruise on the beautiful Bosphorus, live music and all-night dancing or a glance at Istanbul's historical sights, all are within reach when you stay with us at Chambers of the Boheme. With hundreds of bars, cafés, and clubs within walking distance, you can kiss those car keys goodbye. Situated in a beautifully restored 19th century building, Chambers of the Boheme offers the glamour of the Bohemian lifestyle, without compromising modern comforts. Private, semi-private, and family-style rooms are available. Relax in our large common area and patio, or socialise with other global travellers in our newly renovated espresso bar. We also have a rooftop terrace providing amazing views over Istanbul, which is a great place to read or drink especially in the summertime. When you are a guest at Chambers of the Boheme, we want to ensure you have the best experience possible.Our reception is open 24 hours a day and we are happy to answer any of your questions or queries. We provide FREE city maps of Istanbul as well as local advice on the best things to do and see to make the most of your time here in Istanbul. We look forward to welcoming you soon. Istanbul's Hos Gelding! Tophane Tramvay İstasyonu'na sadece birkaç adım mesafede kurulmuş olan Port Hotel Tophane-i Amire, ikonik Galata Kulesi'ne 750 metre uzaklıkta bulunmaktadır. Otel, modern olanaklarla donatılmış şık konaklama birimleri sunmaktadır. Konuklar tesis bünyesindeki konsiyerj masasından ve ücretsiz Wi-Fi erişiminden yararlanabilirler. Port Hotel Tophane-i Amire'nin klimalı oda ve süitleri toprak tonlarında dekore edilmiştir ve şehir manzaralıdır. Odalarda düz ekran uydu TV, minibar ve elektrikli su ısıtıcısı mevcuttur. Her birimde kasa ve ücretsiz çay/kahve yapma imkanı standarttır. Her gün fiks menü olarak kahvaltı servis edilmektedir. Alakart restoranda dünya mutfaklarından çeşitli yemekler sunulmaktadır. Otelin barında serinletici bir içkinin tadını çıkarabilirsiniz. Oda servisi de hizmetinizdedir. Şehrin Asya yakasına kolay erişim imkanı sunan Kadıköy Vapur İskelesi, 650 metre uzaklıktadır. Tramvayla tarihi yarımadaya kolayca gidebilirsiniz; Sultanahmet ise 2,7 km'lik bir yürüme mesafesindedir. Atatürk Havalimanı 20 km mesafede olup ek ücret karşılığında havaalanı servisi sağlanmaktadır. Just a 5-minute walk from Hagia Sophia and Topkapi Palace, this hotel offers modern accommodation with free wireless internet access. It has a rooftop terrace and offers a buffet breakfast. In the heart of Sultanahmet, Agora Life Hotel offers an ideal location for guests who want easy access to Istanbul's most historic sites. Each of the rooms is tastefully decorated and has contemporary wooden floors. They come equipped with LCD TV and laptop-size safes, and include a private bathroom with a bathrobe and slippers. Thoughtful touches also include a fruit basket and a daily bottle of mineral water. Istanbul's Grand Bazaar is just 10 minutes' walk away. There are also excellent public transport links close to Agora Life, providing easy access to the rest of Istanbul. Conveniently located in Bostanci, Plus Hotel Bostanci Atasehir offers a spa centre and massage treatments. Free WiFi access is available in all areas. Free on-site parking is also available. Modernly decorated, each room here will provide you with air conditioning, a minibar and a seating area. Featuring a shower, private bathroom also comes with a hairdryer and free toiletries. You can enjoy city view from the room. At Plus Hotel Bostanci Atasehir you will find a 24-hour front desk, providing room service. Other facilities offered at the property include a shared lounge, a tour desk and a vending machine. Laundry is also provided on request at an extra charge. Istanbul Ataturk Airport is 29 km away. Atasehir is a great choice for travelers interested in entertainment, old town and nightlife. Our hotel is right in the centre of Istanbul Old City. 50 meters from Sirkeci Tramway Station and 60 meters from Yeni Cami - New Mosque and Spice Bazaar. The rooms are very carefully decorated with fine art designer with all kind of comfort. (LED TV, A/C, Private Bathrooms, WIFI, Tea/Coffee Machine,Hair Drier...etc) Not only touristic activities, we would like all of our guests to experience real Turkish Local life. We would like to give information where local people eats, shops, dances and enjoys. So it will be a total new life taste for a foreigner in Istanbul with trusted advisors.